This summer we were contacted by Sky Vehicle Technology, who were looking to create mobile TV studios for premier league football matches. They needed a portable floor that would hide the cables required for the central illuminated table. In addition, they also required a printed floor which could provide an exact grid for positioning cameras. Due to the ability to print direct to our floor, we were able to suit their exact requirements. The two floors clipped together with a strip of clear tiles in between. This was illuminated from the underside to help with the AR software. Our background is the design and build of exhibitions stands and retail displays. As a result, we were able to create the whole of the mobile TV studio. We chose to use an Octanorm modular system as it locks together with precision. Every time it is installed, it’s exactly the same size. We used the tension fabric system with Chroma Green fabric to create the green screen they needed. 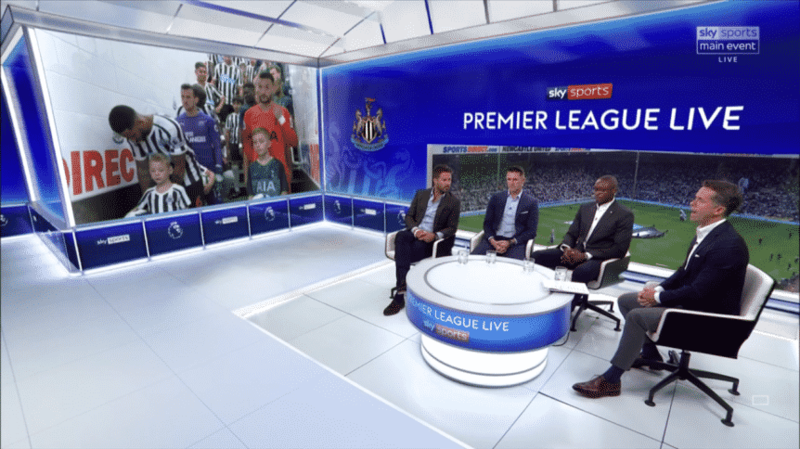 The Augmented Reality technology works to create the illusion of a much larger studio for presenters and pundits to sit to analyse the game. Whilst at the same time allowing a clear view over the pitch through the rear window of the unit. Sky engineers required a precision TV unit to achieve this. Consequently, this was the first time this has been possible for a mobile unit. 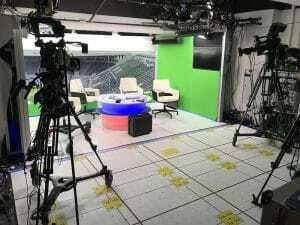 This type of mobile TV studio is a new venture for Sky and Cableflor and it is always exciting for us to explore new uses for the floor system. We are continuing to work with the Sky team and are proud to have been chosen to create this effective solution for mobile programming at live events.